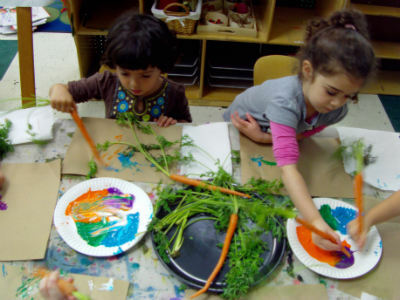 Beyond Basic Learning: On the Greenis a state-of-the-art nursery school operating in Fort Greene/Clinton Hill area of Brooklyn, New York. Our school has an open space design with bright natural sunlight and an adjacent private outside area for children to experience the outdoors. We are in close proximity to residential homes, local businesses and transportation where many of our families reside. Our infant program starts at 2 months to 3 years and provides children the opportunity to learn at their own pace. We encourage families to come into the classroom and participate with us as we sing, read, and learn with the children in our care. Beyond Basic Learning: On the Green is a small intimate setting giving families the opportunity to know one another and develop long lasting friendships. Our families come from the community with roots from around the world representing more than 15 different countries in any given year. With an ‘open-door’ policy for our families, you may find a father or a mother participating in our circle time or celebrating their culture with us. We are committed to providing an environment where each child's natural curiosity to learn is guided to support the acquisition of skills that promotes critical thinking and self-awareness. Our educational approach embodies the works of educational leaders such as Montessori, Piaget, Sprague-Mitchell, Dewey and Vygotsky, among others, in framing our curriculum. In our school not only do we believe in the importance of holding and nurturing young children but understand that it is sets the foundation for the later years. Welcome to Beyond Basic Learning; On the Green where we go beyond the basics for our children!